Well-known for his famous ride on April 18, 1775 to warn Samuel Adams, John Hancock and the militia that "The British Are Coming", one of the most famous quotes in American history. Revere became interested in the movement for independence and in 1773 took part in the Boston Tea Party. During the period of 1776 - 1779, Revere commanded the garrison at Castle William in Boston Harbor and in 1779, commanded the artillery in the disastrous Penobscot Expedition, an attempt to invade British territory in Maine. The costly blunder by Revere led to accusations of cowardice and insubordination and he was forced to leave the military. As a silversmith, Revere's work remains as highly valuable today. He was the first American to discover the process of rolling sheet copper, building the first copper rolling mill in the nation. His skills as a craftsman led him to engrave plates for Continental currency, as well as the official seal of the colonies. Colony of Massachusetts Bay note for ten shillings. 7” x 3 5/8”. Massachusetts. May 25, 1775. This note, part of the first emission printed by iconic American patriot Paul Revere, bears the signature of Henry Gardner, the Receiver General of Massachusetts. Following the Battles of Lexington and Concord, the Provincial Congress of MA authorized an emission of £25, 998 in “Soldiers’ Notes” in order to raise an army. 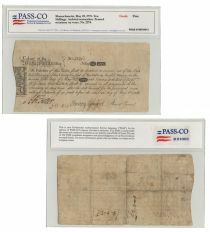 These notes, the first emission printed by Paul Revere, were paid to the men who soon found themselves facing British regulars at the Battle of Bunker Hill. Working night and day, Revere threw himself into this task, at times under the watchful eye of two members of congress. Moreover, the plate used for ten shilling notes in this emission was the backside of a recycled plate that had originally been used for Revere’s famous print of the Boston Massacre. This completely engraved note, excepting signature, notations and handwritten serial number, bears partial acantus leaf design and “MBC” (Massachusetts Bay Colony) monogram at scalloped left edge. Below this design is an “American Paper” notation, which the “Amer” of American. Paper also show partial “GR” & crown watermark, which refer to King George III. A great, historically rich note. This item has been encapsulated and graded by PASS-CO. Fine.